Employees, motivation, and games. The 2018 Gamification Survey is out! In 2014, we ran a gamification survey among our users to get a picture of the use of gamification in eLearning. We surveyed about 100 professionals who create, design and manage employee training. You can find those at the end of this post. But that survey only gave us the perspective of online course creators. We also wanted to know what employees who use and engage with gamified software think. Do they like it? Does gamified software boost productivity? What’s so motivating about gamification software anyway? So in June 2018, we surveyed 400 U.S. employees to get answers to all those questions. All respondents had experienced gamification in the workplace in an app/software they use on a regular basis. Age ranged from 18 – 69, with a mean of 36 years old. Today, we’re going to share what we found. Employees feel that gamification makes them more productive (87%), more engaged (84%) and happier (82%) at work. 1. Do employees like using gamified software? To determine if employees enjoy using gamified software, we asked four questions to measure “enjoyment”. We found that 85% of respondents would spend more time on software that was gamified and 84% would keep gamified software for longer. We also found that 81% agreed they were more likely to invite a colleague to gamified software while 70% indicated they’d pay more money for software that had gamification elements. Then we calculated the average of these four scores to get a single score for “enjoyment”. 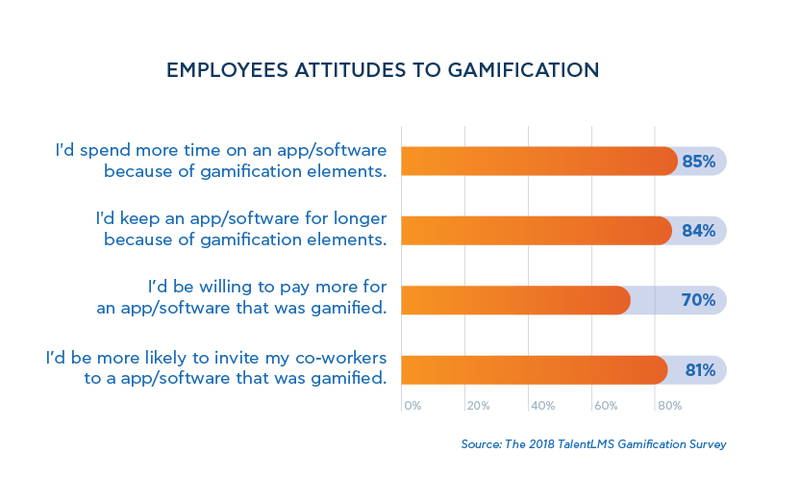 lt appears that 80% of employees enjoy using gamification software at work. New survey finds 80% of employees enjoy using gamified software at work. 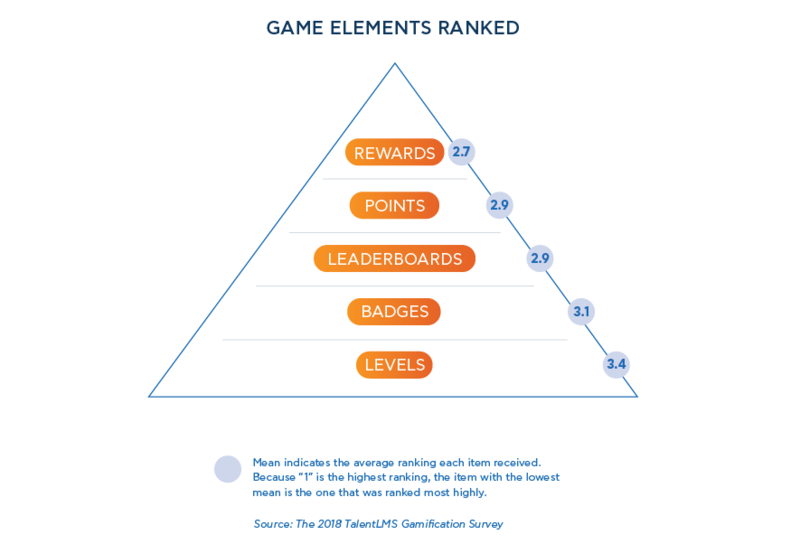 Next, we asked respondents to rank points, levels, badges, leaderboards, and rewards to discover which specific game element employees find most motivating. The winners? In order, rewards, points, and leaderboards. This finding mirrors the results of our 2014 gamification survey where we found that 64% of respondents said they’d be motivated by leaderboards, while 74% said that a point system would increase their engagement with an eLearning application. 2. Does gamified software boost productivity? You betcha! We found that gamification boosts the trifecta of employee metrics. Employees agree that gamification makes them more productive (87%), more engaged (84%) and happier (82%) at work. This held true across gender, age, industry, and roles. 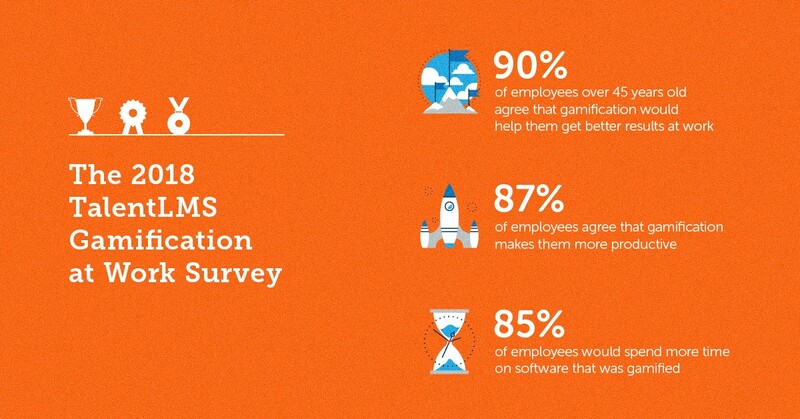 Survey finds that 87% of employees agree that gamification improves productivity! This is not a surprising result. Who doesn’t love games? In 2015, 42% of Americans played three hours of video games a week.1 We found that 67% of respondents indicated that they played games “often” or “every day”. Most people just seem to have a natural affinity toward games. 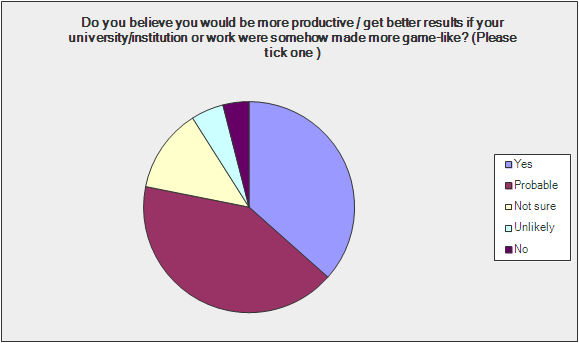 In our 2014 gamification survey, we asked respondents whether they’d be more productive and get better results if their work was more game-like. We found that an overwhelming majority (79%) agreed. We asked the same question in the current survey and got the same result – with an 8% increase! 87% of employees believe they’d be more productive if their work was made more game-like. Now, self-reports aren’t quite reliable. 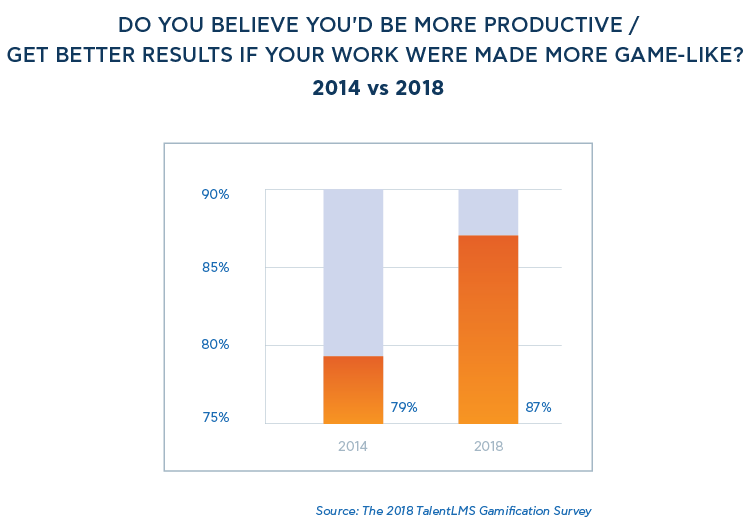 For extra reliability, we turn to evidence coming out of the corporate world where they’ve found that gamification does indeed boost productivity. For example, cloud call-center business LiveOps who employ over 20,0000 work-at-home call agents needed a way to motivate and engage their agents. Using a combination of game elements, including points, badges, and leaderboards, they got some stand-up-and-pay-attention results. 3. What’s so motivating about gamification anyway? Ask any academic or researcher and they’ll agree that our understanding of gamification is still in its infancy. Our understanding of human motivation though? That’s in its prime. 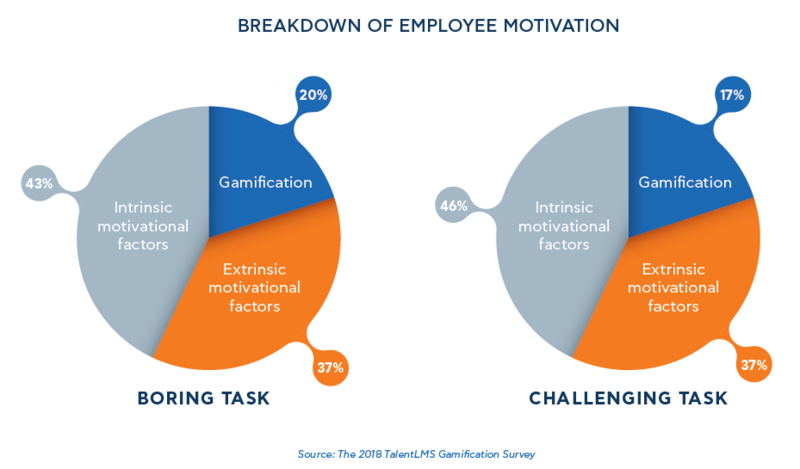 So, we used Ryan and Deci’s Self-Determination Theory as a basis to form questions that would help us understand how gamification motivates employees to be more engaged, more productive and happier. Overall, respondents indicated that intrinsic motivational drives were more likely to motivate than extrinsic drives. This was true whether the task was challenging or monotonous. 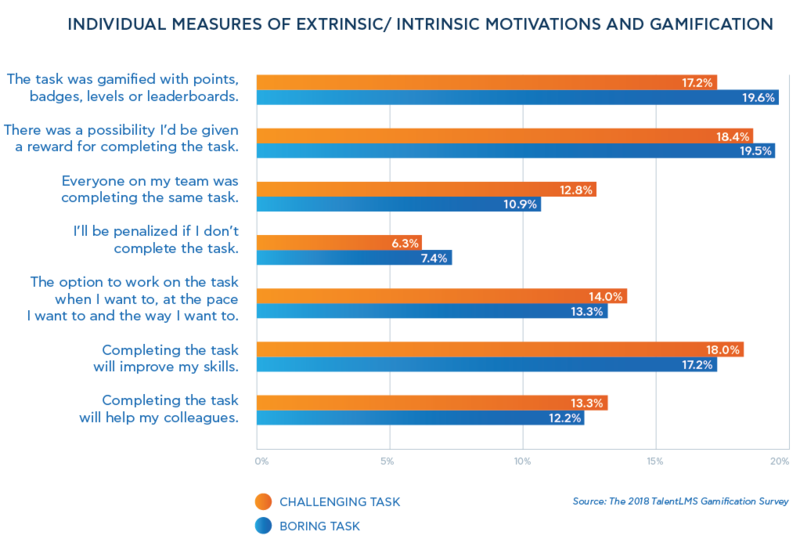 Specifically, employees were mostly motivated by intrinsic motivational drives (43%) versus extrinsic (38%) when completing a boring task and intrinsic drives (45%) versus extrinsic (37%) when completing a challenging task. Next, we isolated our wild card and compared it against individual measures of extrinsic and intrinsic drives. 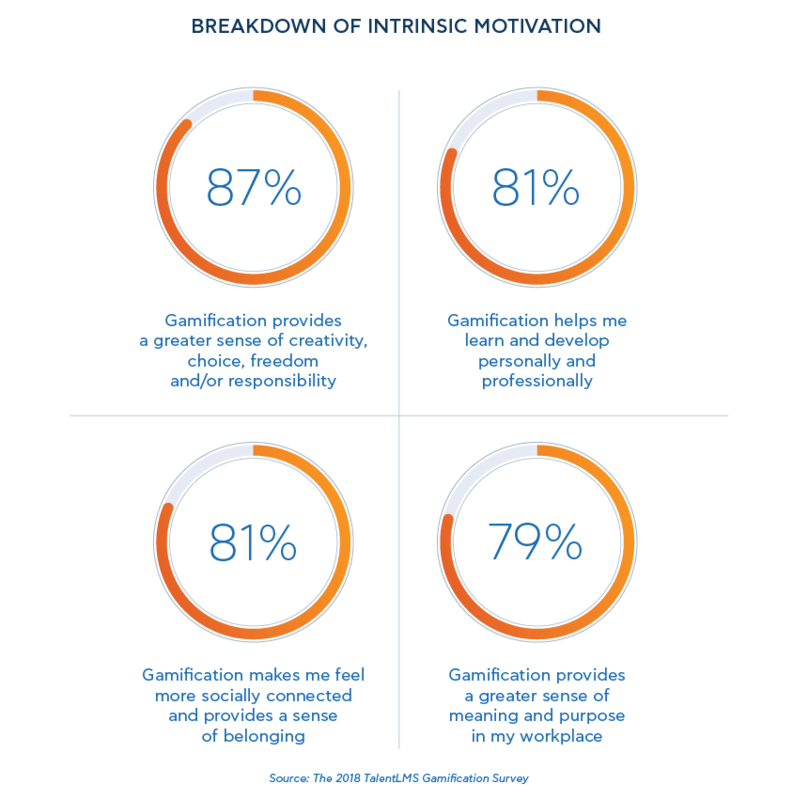 How many respondents chose gamification as a motivating drive? Twenty percent of respondents in the boring task and 17% percent in the challenging task indicated they’d be motivated by game elements. Here, we found that over 80% of respondents agreed that gamification makes them feel more socially connected (i.e. relatedness), gives them a greater sense of creativity, choice, freedom and/or responsibility (i.e. autonomy), and helps them develop personally and professionally (i.e. mastery). 4. Does gamification affect all people in the same way? In our survey, we found many differences in gamification attitudes according to age, generation and gaming habits. Here are just a few of those differences. First, we found that 92% of respondents who play games often were more likely to indicate that they’d be more productive if their work was made more game-like. As the frequency of game playing dropped, so did the likelihood that gamified work would make them more productive. Another finding we observed about frequency of game playing was that 42% of those over 45 years old indicated that they played games every day compared to only 31% of respondents aged 18-24. In 2008, the Pew Internet and American Life Survey6 found a similar result and hypothesized that older Americans simply have more time to play games more often than younger people as 77% of senior gamers had indicated they were retired. We also observed some surprising trends in attitudes toward gamification and motivational drives across age-range, but not gender. For example, when we asked respondents to indicate whether they think they’d be more productive and get better results if work was made more game-like, agreement increased as employees got older. When we looked at what would motivate respondents more when completing a task, we found a similar age difference in the boring task but not the challenging task. 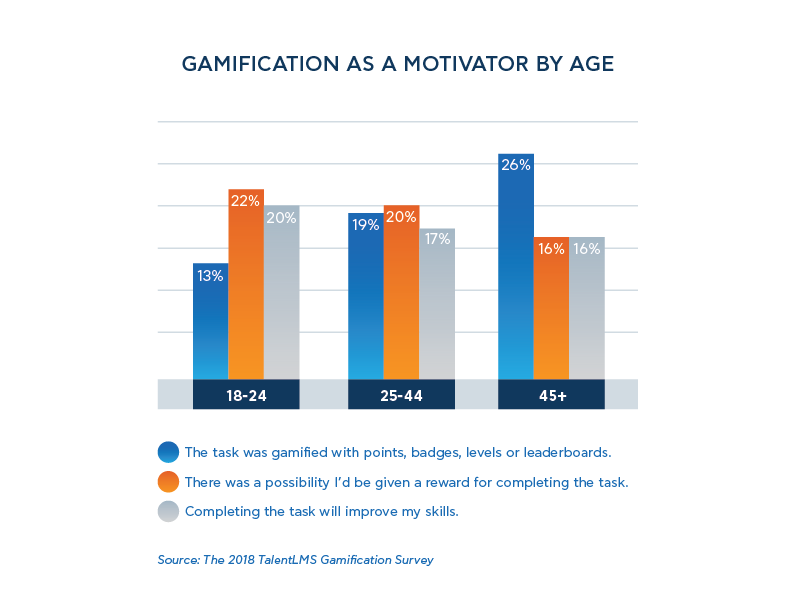 In the boring task, as age range increased so did the likelihood of participants indicating that gamification would motivate them more than other motivational drives. Thirteen percent of the youngest cohort (18-24 years old) as opposed to 26% of the oldest cohort (over 45 years old). Older employees are more likely to be motivated by game-elements than younger employees. In the same question, we also found that motivation from rewards decreases as employees get older. Twenty-two percent of the youngest cohort (18-24 years old) as opposed to 16% of the oldest cohort (over 45 years old). How do we explain this difference? One reason might be that older employees have better salaries than employees just starting out in the job market. So for this younger group, rewards will be more motivating than gamification. Younger employees were also more likely to indicate “mastery”, or improving skills as a highly motivating drive for completing a boring task. This decreased as employees got older. From 20% for those aged 18-24 down to 16% for employees over 45 years old. Another interesting trend we found was when we looked at individual game elements by age range. While levels were consistently ranked last (in terms of motivation) for all age-ranges, younger employees (18-24 years old) ranked them second following rewards. Finally, when we asked respondents to indicate how they felt when a task was gamified, the most popular answer was “motivated” at 25% followed by “eager to complete it” and competitive” both at 18%. 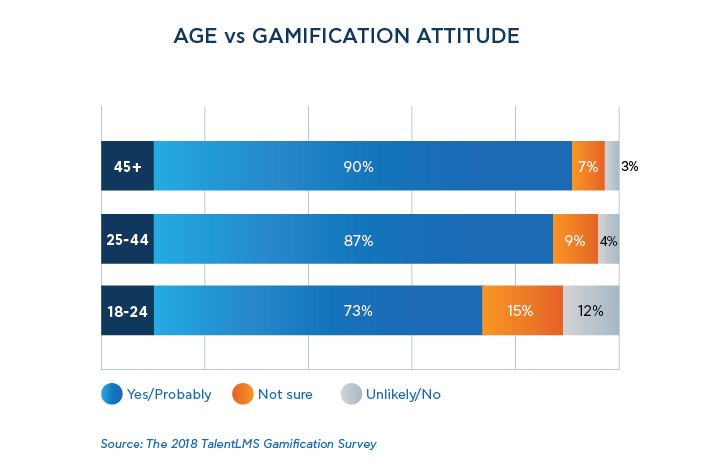 When we went granular, to the age-range level, we noticed gamification made 24% of 24-34 years old feel more competitive, while 37% of those over 45 years old were more likely to feel motivated by gamification. 5. Do carrots work better than sticks? In our gamification survey, we found that respondents were least motivated by the possibility of punishment. This was true for both monotonous and challenging tasks. When asked to pick their top two motivating factors in completing a challenging task, only 7% of respondents chose “I’ll be penalized if I don’t complete the task.” In completing a monotonous task, that number dropped to 6%. Penalizations, it seems, do not motivate employees. Instead, we observed that carrots, whether those are financial rewards, virtual badges, or intrinsic drives like mastery over a skill, are far more motivating. Carrots win again! Survey finds that only 7% of employees are motivated to avoid punishment. After studying our results, we can confidently say that employees want gamification in the workplace. But we can also say that gamification, in and of itself, is not a silver bullet. For every LiveOps success story, there’s a story where introducing gamification elements had no effect. And in some cases, performance dropped. Gamification is complex because human motivation is complex. So, adding points to a task and calling that gamification, isn’t going to cut it. Game elements, without rhyme or reason, aren’t going to motivate employees to be more productive, or more engaged, or even happier. Have you ever kept playing a game you didn’t like? Businesses shouldn’t be asking, “Does gamification work?”. But, “How can we make gamification work for our teams?” And here we can make a few recommendations. Start small. Test a few gamification elements in one part of your business. For example, it’s really easy to activate gamification tools in online training software like TalentLMS. With one click, your courses can be enriched with points, badges, and leaderboards. But you’ll always have control over which courses, and which users, you want to target. If there’s anything we’ve learned from this survey it’s that gamification can be a powerful ally when implemented in the right way to the right people. Over to you. What do you think of our findings? What surprised you? Didn’t surprise you? Leave a comment and tell us about your experiences with gamification. Want to use gamification in your employee training? Read these. Adults and Video Games, Amanda Lenhart, Sydney Jones & Alexandra MacGill, Pew Research Center, http://www.pewresearch.org, 2008. To understand if gamification could build a community, we asked respondents to indicate how often they comment, review and share content. The answers show that passive reading of course reviews and forum comments is more prevalent than writing reviews and commenting (83% versus 50%). 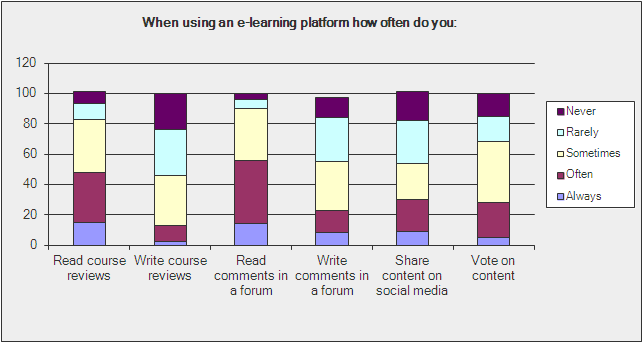 Half of the users don’t bother sharing e-learning content on social media either. And a surprisingly large number (32%) rarely or never vote on content. These results show there’s huge room for improvement to design courses and features that will inspire learners to be part of their e-learning community. Which game elements are most motivating? The majority (62%) of respondents said they’d be motivated by leaderboards. Respondents also indicate that leaderboards would boost competition among learners. A whopping 89% said that a point system would increase their engagement with an e-learning application. Users also indicated that they’re heavily (82%) in favor of multiple difficulty levels and explorable content. But they don’t seem to particularly care for badges or LMS links to existing social media, like Facebook and Twitter. In any case, a strong demand for gamification is already here: 79% of the respondents said they’d be more productive if their university/institution or work was more game-like. To understand which kind of rewards might increase engagement, we asked respondents to rate a few options. We found that most users seem to prefer discounts on new content/courses (69%) and access to exclusive content (78%). Rewards such as badges and score points, while gimmicky, still entice 60% and 50% of respondents respectively. 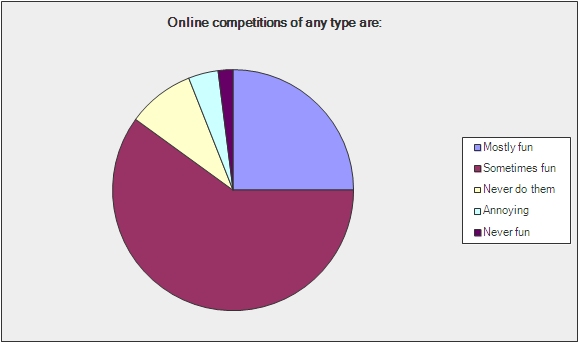 A respectable percentage of users (25%) like online competitions, which they find “mostly fun”, while a large 60% majority finds them “sometimes fun”, something that shows that implementation matters. What about other game elements? From various gamification and engagement techniques, users indicated they prefer progressing to different levels, scores, real-time performance feedback, and activity feeds. The least loved elements were virtual currencies, avatars, competition with friends, virtual gifts, and being part of a narrative (so-called “interactive fiction”). 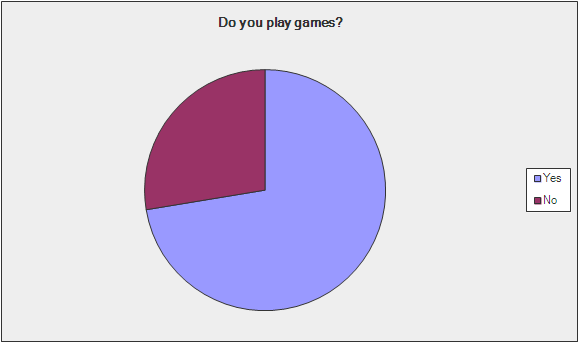 To look at the bigger picture, we asked respondents if they play games. And they do! 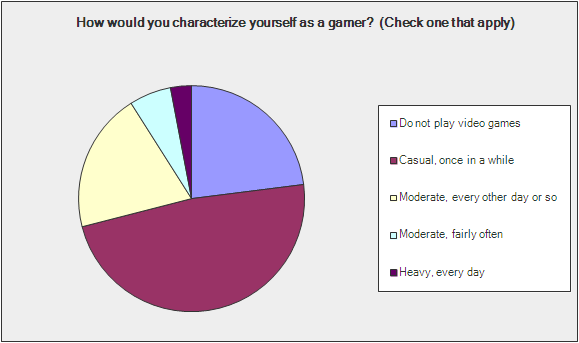 An overwhelming majority (75%) responded that they play computer and/or mobile games (50% “casually” and 27% “moderately to fairly often”). 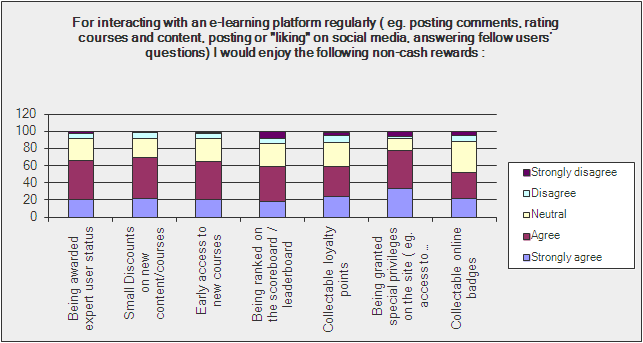 The survey results make a strong case for gamification as a way to increase learner engagement in online learning. Because users reject some gamification elements while embracing others, it’s important to choose the right elements in your gamification strategy. The study of gamification in elearning is far from over. In designing the LMS platforms of tomorrow, we’ll be conducting more research into user habits and use cases to discover how the various techniques available affect e-learning engagement and performance. We’ll keep you updated on any new surveys and research we run, and you’ll most likely be able to use new gamification features based on what we find in future versions of TalentLMS ― so, stay tuned, and keep learning!